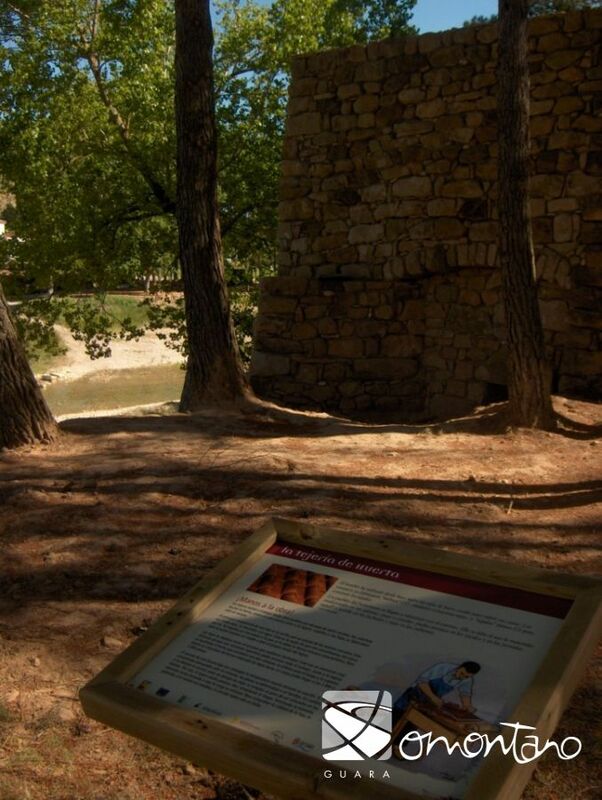 From the children’s playground in Huerta de Vero, cross the river using the huge stepping stones, to join a footpath on the opposite bank. (The path comes from the village and crosses the river via a cement footbridge.) At the fork in the path, bear to the left until arriving in a small pine forest where the remains of an old tile works can be seen. The short walk to get there takes approximately five minutes. For centuries man has used fired clay tiles to cover the roofs of houses and other buildings. In fact the Romans made imbrex, similar to the tiles used today, and flat tegulas for the construction of roofs. Tiles have traditionally been used to cover the roofs of houses in the villages of Somontano over centuries and because of this the tile maker’s role was essential. Tile makers were travelling tradesman who came from other villages at the request of local people. During the time they worked they lived in a small house next to the tile works. However, this was only during the summer months as the bricks and tiles needed the sun’s heat to harden so were not produced in winter. The main component of a tile is clay, which was removed from nearby mountains, mixed with water, meaning that the tile works had to be located near a river. The resulting dough-like mixture was formed into concave shapes using a mould or even the tile maker’s thigh. The tiles were left to air in the sun in order to remove the moisture. This was a delicate moment as a sudden storm could ruin a lot of hard work. Next to the tile works was an oven that had two chambers; the lower was for the fire and the higher chamber was for the ordered placing of dry tiles. This area could take between 2,000 to 3,000 tiles at one time. The secret to a good tile was to maintain the perfect temperature while they were in the oven; too much heat and the tiles would lose shape or melt. In addition, if the tiles were removed too early, they would break soon after being placed on the roof. Because of this, the tile maker would often spend days stoking the fire to his satisfaction. Once the tiles were removed from the oven they were left for several days to cool. To check their quality the tile maker would hit them; if the sound was metallic then the process had been a success.